I’m leaving, on a jet plane, don’t know when I’ll be back again … actually yes I do. Tomorrow morning Mario and I will be hopping on a plane to visit my other moms and Mario’s sister and niece and nephew. And while I give Onterrible a hard time, because you know, it is terrible, it’s got two great things going for it right now: 1. Mario’s family who I do so love, and 2. The sun. 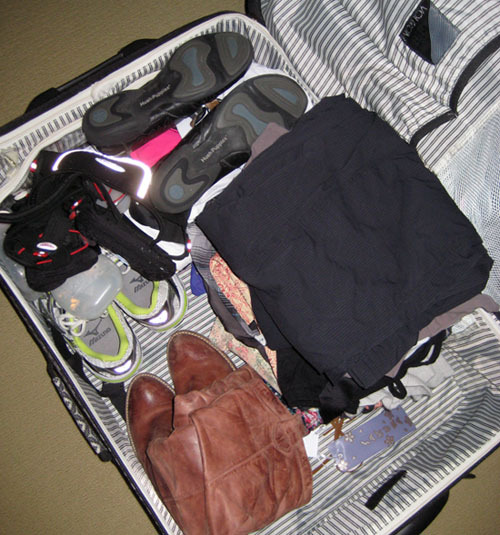 Yes, I am one of those packers … pack everything to ensure you don’t forget a thing! While there, I’ll be running the Toronto Half next Sunday. People keep telling me to take it easy on that run given that I’ve got a full marathon just two weeks later and Sunday’s supposed to be a training run. I might listen to them, I really might, but I can’t promise anything. The second I see someone passing me, which would inevitably happen A LOT with my LSD pace, that competitive demon of mine might just dig his sabre teeth right into the backs of my calves forcing me to go a faster pace. I’m not to blame, it’s that sabre-toothed demons fault if I come in at race pace. And because we are going to the land of make belief (make belief meaning a land with no Internet aside from my iPhone) the blog will be on hiatus until I return next Wednesday with a post race and post Onterrible recap. So dear blog friends, enjoy your week. This entry was posted in Races, Travel and tagged Goodlife Toronto Half Marathon, Onterrible. Bookmark the permalink. Have an awesome time back East Katie, enjoy the race! I just checked the weather and I don’t want you to get your hopes up but right now it’s calling for a whole lot of rain Saturday till Monday. I know the weather network can’t be trusted very much. I just hope for your sake (and my own) since our halves are on Sunday that the rain gets pushed back till later in the week. I also hope that for you so that your On’terrible’ experience won’t be so terrible! Have fun and good luck for your run!